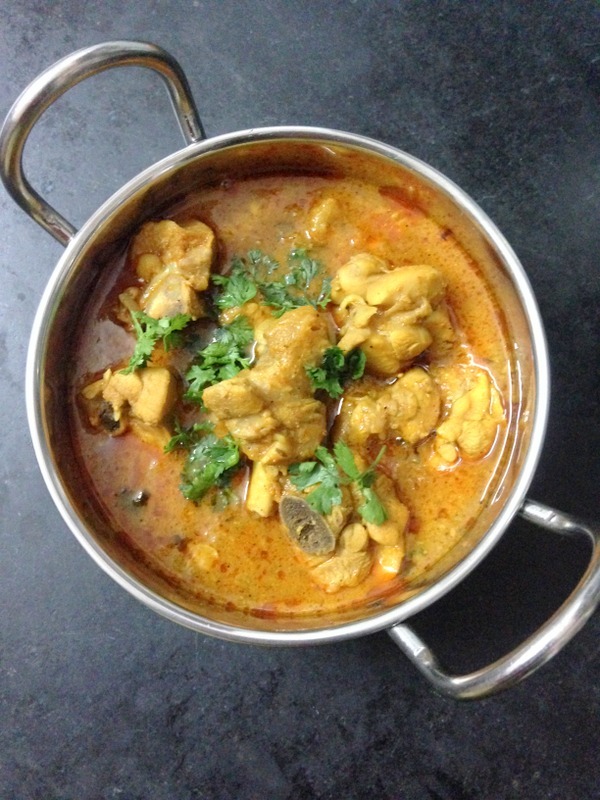 Chicken Curry Recipe is the most delicious chicken curry and is the most sought after recipe by everyone. The chicken recipe here is made with onions and tomatoes and few other ingredients which bring out an amazing aroma and taste in the curry. 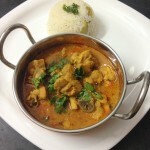 I have made a regular chicken curry but into it I have added few more ingredients to make it even more delicious. 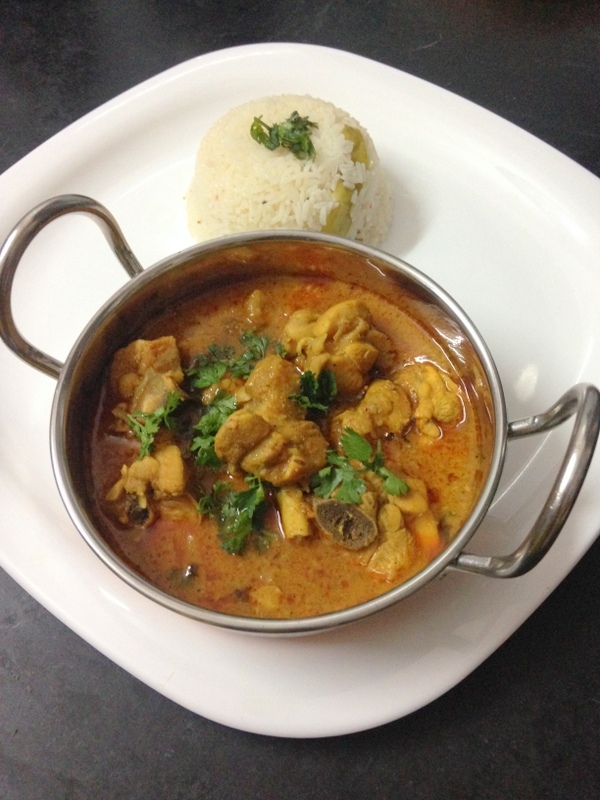 Chicken curry is one of my favorite recipes and I can eat chicken almost everyday. There are various ways to make chicken and being a Hyderabadi chicken curries are made in korma form or they are made as rich gravies. But, here no rich ingredients are added and the curry is made with simple ingredients that are easily available at home. Chicken is the mostly preferred non veg dish and rest other follows. Chicken recipes are usually liked by non veg freaks. There are thousands of chicken varieties and if my blog readers give me a thumbs up for this recipe then I shall be glad to update with many chicken varieties. This chicken recipe is made with onions, tomato puree, paste of coconut, green chillies and coriander leaves. The dish is so good that it goes well with pulao recipes and it can never be enough. The chicken curry recipe which I have shown is a gravy kind of a recipe and can also made during gatherings and celebrations. Chicken is often made at home and I prefer trying out many variations of chicken curries and chicken korma recipes and also unique varieties with chicken. With time I would like to flood my blog with various chicken varieties to be tried and ofcourse every recipe on my blog is tried and tested. Do keep subscribing to our mail list to get amazing chicken recipes straight into your inbox. 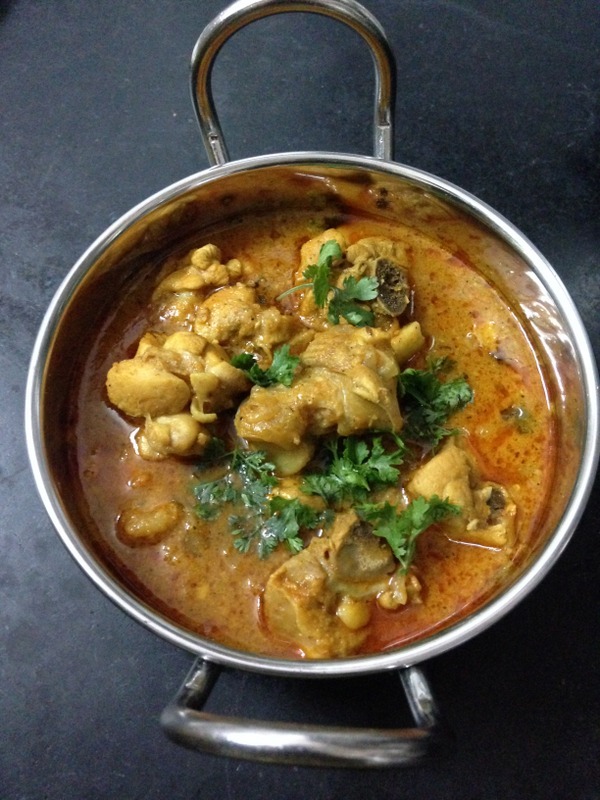 A chicken curry recipe deliciously made with onions, tomatoes and green paste. Firstly, in a blender add slightly roasted coconut pieces, green chillies, coriander and blend well, add water and make a fine paste and keep it aside for further use. Add whole spices such as cinnamon stick, cardamoms and cloves. Add sliced onions into it and cook for few minutes till they get soft or translucent. Add chicken and roast it well until a change in color appears. Add salt, turmeric powder, red chilli powder into it, mix and cook well. Add tomato puree into it, mix and cook well for few minutes until oil leaves the sides. Add the blended paste of coconut, green chillies and coriander leaves. Mix the whole mixture well and cook until masala is cooked well and oil leaves the sides. If the gravy is thick add little water as required. Add spices such as garam masala powder, kali mirch powder, coriander seeds powder, chicken masala powder and mix. Cook the chicken until it gets tender or cook for about 15-20 minutes by covering the lid on medium flame. Garnish the curry with coriander leaves and serve hot with pulao or plain rice. 1.Here I have used desiccated coconut but freshly grated coconut too can be used instead of dry coconut. 2.If one does not prefer using coconut then just add paste of green chillies and coriander leaves. 3.Here I have used slow cooking method rather than making it in the pressure cooker and slow cooked method gives the best taste. 4.One can add additional spices such as bay leaf into the curry. 5.To make the tomato puree, blend the tomatoes directly in a blender or another method is boil the tomatoes, peel the skin and then make the puree, but in this recipe I have made the puree of the tomatoes directly and cooked the puree well enough. There’s nothing quite like a good chicken curry on a cold winter’s day. Love all the ingredients in this dish. I make curries quite often, but am not so sure of the chicken masala powder? Perhaps it is just another Indian spice. It looks delicious. Thank you for bringing your fragrant chicken curry to FF Asiya! It is beautifully presented and so welcomed on a chilly day. It must smell divine cooking with all those interesting spices. 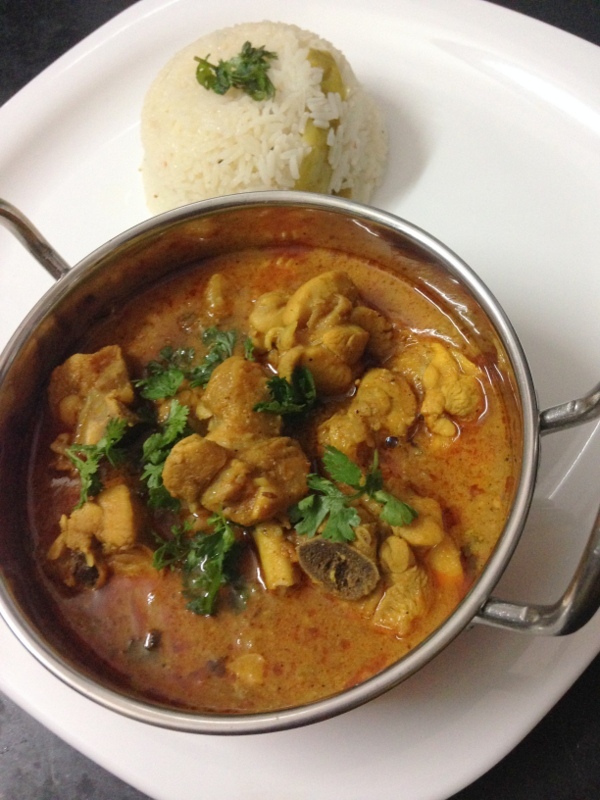 We love chicken curry at my house, this sounds delicious! Thanks for sharing at What’d You Do This Weekend?! Yr description abt cooking method is awesome. I am inspired to cook every day. God bless u.
I tried this recipe and it was delicious. Which part of India is it local to? My family is from U.P. Thank you.